After learning about the lifecycle of a butterfly, create a butterfly feeder to observe the various species that live in your neighborhood! This sponge feeder is super easy to make from Rainbow Sunshine and ehow. Punch holes in a vibrant colored sponge (pink, yellow, orange, purple to attract butterflies) with an x-acto knife. Next, push through the hole with a screwdriver (4 holes, 2 on each side). Thread string through your holes so it balances when hung. Then, mix up nectar - 4 parts boiling water to 1 part sugar. Stir and let the sugar dissolve. Remove from stove or microwave, let cool down, and dip! Refrigerate extra solution for 1 week, then dispose it. Dip the sponge in the nectar so it soaks up. Finally, hang it outside. Keep your eyes peeled for butterflies! Clean your sponge and change the nectar once a week. 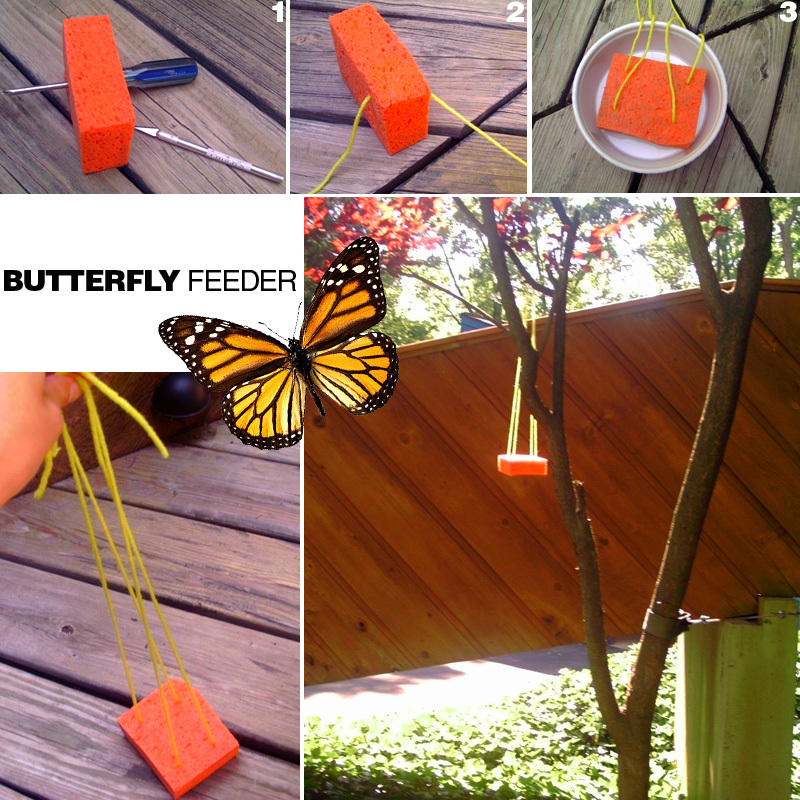 Besides this butterfly feeder, check out Our Big Earth's version. You can also just lay fruit on a plate. Hang it in a tree or sit the plate on a table outside via Garden Web! Unplug Your Kids did an cool night experiment from The Learning Channel. 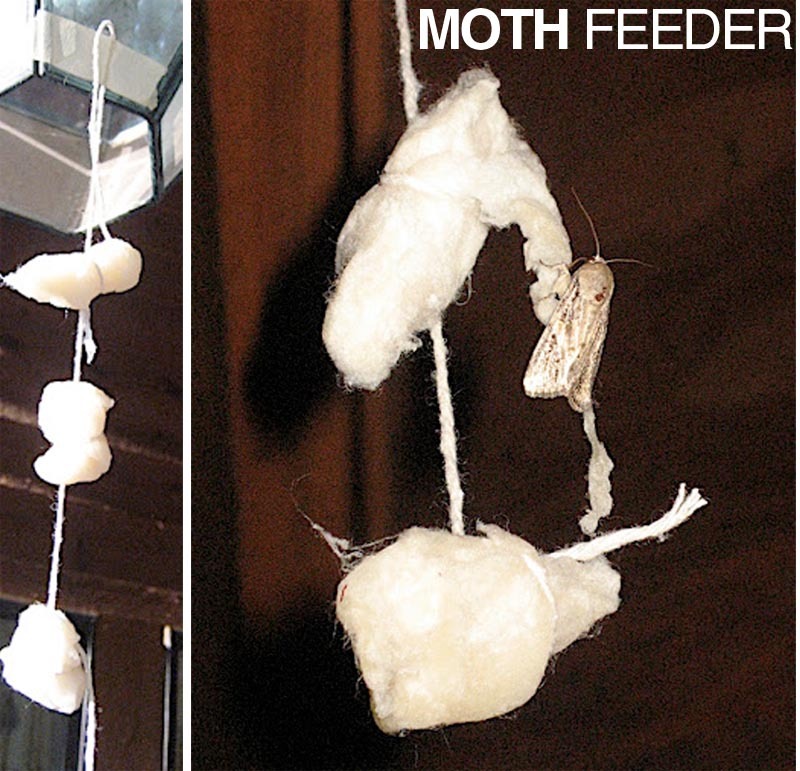 They constructed a moth feeder, so kids could see the many different kinds of moths that reside in their environment. Click here for the tutorial!